Catherine Cram, M.S., is an exercise physiologist who specializes in prenatal and postpartum fitness. She created her company, Comprehensive Fitness Consulting, LLC in order to provide prenatal and postpartum fitness certificate trainings and materials to health care and fitness professionals. She is the author of the prenatal fitness chapter in the textbook Women’s Health Care in Physical Therapy: Principles and Practices for Rehabilitation Specialists (Lippincott Williams & Wilkins, 2009). Ms. Cram is also author of Fit Pregnancy for Dummies (Wiley 2004). 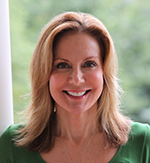 She is frequently a featured speaker at conferences for medical, fitness, and material healthcare professionals. She received a master’s degree in exercise physiology from San Diego State University. Ms. Cram developed and was featured in the Healthy Learning series of DVDs “Developing a Pre- and Postnatal Fitness Program,” and “Postpartum Recovery Techniques and Exercises,” produced in cooperation with the American College of Sports Medicine. She serves as the maternal exercise expert on the website www.babyfit.com, and writes a monthly women’s health blog on www.sparkpeople.com. Ms. Cram received her masters degree in exercise physiology from San Diego State University.